Sorry folks, I know this one is long, but I think worth the read. Maturity is, in part, the ability to know when the story isn’t finished. In the Bible book of 2 Kings, we read the story of a woman from the village of Shunem. This was a woman with a secret dream. Deep in her heart, she longed to have a child, but as the years went by her dream slowly died. She and her husband had money, and the things money could buy in those days. But she didn’t have what she wanted most: a family. She spoke to no one about this secret dream. She buried it deep inside. Time passed. The dream died, and she did her best to move on with life. She grew cautious, not daring to dream any more. Then the prophet Elisha came through the village. Being hospitable, she and her husband invited him in for a meal. A friendship started. They felt so much at home with one another that this old couple even built guest quarters onto their home so Elisha would have a place to stay. But Elisha had an assistant, and that assistant saw through her answer. “She wants a child,” he whispered to Elisha. I pause here. Why would she say no? Why would any of us say no? Could it be that we’ve had our hopes raised and then dashed one time too many? Could it be that we’ve seen our dreams die, and the process of bringing them back to life is just too painful? Could it be that we’ve settled for second best because that’s all we know. But God said, “Yes.” And a year later, her home was filled with the joy that a new child brings. Yet the story doesn’t end here. The little boy started growing up. One day he followed his daddy out into the fields of the family farm, excited to help out with the harvest. But something happened. Something wasn’t right. The boy buckled over in pain. I don’t know what it was. An aneurism perhaps, or a stroke, or encephalitis. I don’t know. His dad didn’t know either, but he knew he needed care, so he asked a farm worker to carry him home to his mom. There at home, in mom’s arms, the little boy died. I pause again, and I ask you: What kind of God do we serve? I ask you now, because sooner or later life will put this question to you. You will lose something that you deeply care about, and the God you thought you knew and loved will seem terribly far away, aloof, uncaring, arbitrary, capricious. It’s at that time we must make a choice. Are we going to pick up the broken pieces of our shattered dreams and carry them back to God? Or will we turn away from Him, perhaps forever? The woman from Shunem chose to take her shattered life back to God. Understand this: She took it all. Her grief, her pain, her anger, her deep loss. She laid her dead son down on the prophet’s bed in the guest quarters, and set off to find Elisha. “Didn’t I tell you, ‘Don’t raise my hopes’?” she said as she poured out her grief to the man of God. Now here is part of the secret of maturity. 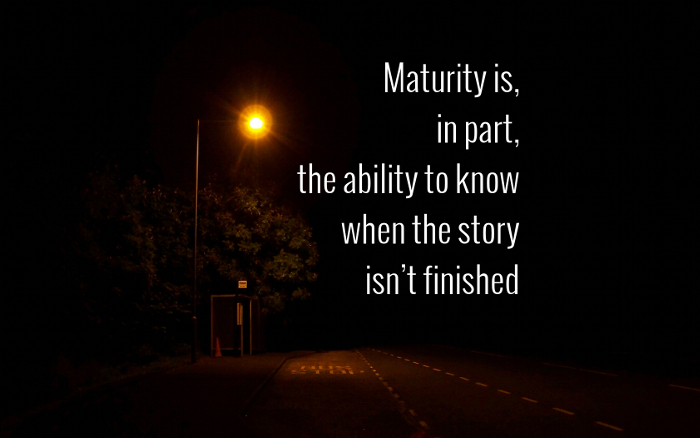 Maturity is, in part, the ability to know when the story isn’t finished. God wasn’t finished. Read 2 Kings 4. The woman’s son was raised to life. So also, your most fragile and precious dreams are eternally safe with God. Will we take the plunge? Will we dance with Him? Will we open up our hearts so wide that maybe we will lose part of ourselves to God? This is an excerpt from our Spiritual Self Defense textbook. More info here. New question: How was Ruth related to David?